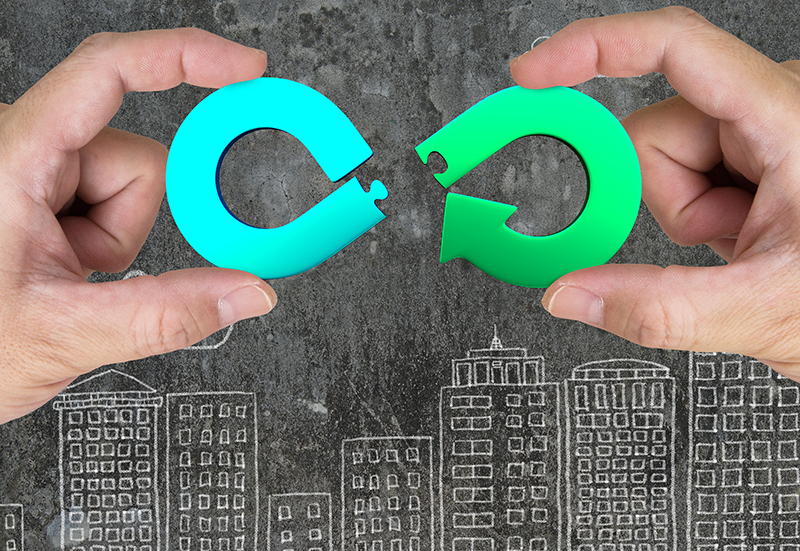 The ‘circular economy’ is a phrase frequently used in the media and by politicians – there is a huge amount written on the subject, which makes it easy to get confused about what exactly it means. At its core, the circular economy is a simple principle – it’s about sustainability. It’s an economy that considers the environmental and social impact of the way we buy and use things, and ultimately the way that we can maximise the beneficial use of our resources. At a practical level, what does adopting the circular economy look like for businesses? resource use is consistent and responsible, making the most of natural resources. A recent study indicates that if all EU states were to adopt the circular economy, there would be a potential €1.8 trillion collective economic annual benefit by 2030. There are also, however, further benefits to businesses that adopt the circular economy beyond improved efficiency and reduction of costs. A recent study indicates that if all EU states were to adopt the circular economy, there would be a potential €1.8 trillion collective economic annual benefit by 2030. There are three broad categories of benefits for businesses adopting the circular economy – environmental, social and economic. The circular economy is grounded in tackling the key environmental issues that we are all familiar with today. Through adopting the principles of the circular economy, businesses can reduce their reliance on using and disposing of the world’s natural resources. Businesses then, through the circular economy, have an opportunity to contribute towards the global effort to tackle climate change. From a social perspective, a greater understanding of where we source our materials has several benefits for businesses. Consumers’ mindsets have changed significantly in this space recently, becoming increasingly socially and environmentally aware; leading to a tendency for consumers to favour companies that are socially responsible. At the same time, a higher calibre of employee is likely to be attracted to such businesses. Finally, from an economic standpoint, circular economy driven businesses are at their very heart more efficient and are therefore likely to be more profitable. A report from the Ellen MacArthur Foundation in 2015 emphasised the vast financial benefits for the manufacturing industry if it were to embrace a cyclical design process. Businesses that adopt these principles will also reap the financial benefits of improving energy efficiency. From an economic standpoint, circular economy driven businesses are at their very heart more efficient and are therefore likely to be more profitable. What does the future hold for the circular economy? Although in its relative infancy, regulation in support of the circular economy is coming. As global political momentum gathers around climate change and marine plastic pollution, politicians, stakeholders and ultimately businesses will need to adapt. Those who have already taken steps in this direction will benefit the most. There are already companies that are shaping themselves around capitalising on the circular economy (i.e. Toast Ale here in the UK). There is still time for less sustainability-minded companies to take the necessary steps to adapt their business models to position themselves within the circular economy.